In child support cases, courts sometimes force people to pay back the government’s welfare contributions to a child, even in scenarios when the person being ordered to pay support is not actually the child’s parent. According to WXYZ-TV ABC 7 Detroit, Detroit man Carnell Alexander is facing that exact situation after an ex-girlfriend of his listed him as the father of her child on an application for welfare benefits. 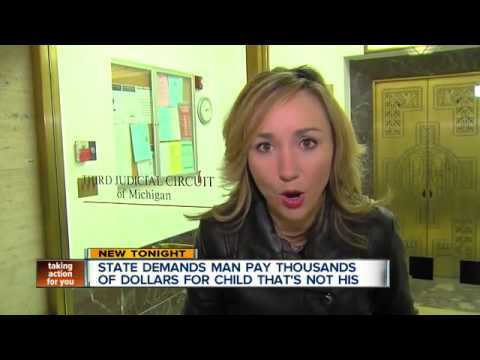 Despite the facts that a DNA test proved that he is not the father and his ex-girlfriend agrees that he should not have to pay support, the State of Michigan is ordering him to either pay back the nearly $30,000 worth of welfare contributions it paid to the child’s mother or go to jail. In 1991, Alexander was informed during a routine traffic stop that there was a warrant out for his arrest due to his failure to pay support for a child that he had allegedly fathered back in 1978. However, Alexander had no children. In a court hearing, the state claimed that he was listed as a child’s father on a welfare benefits application and that too much time had passed for him to request a DNA test to contest its paternity claim. The court argues that he knowingly ignored a court order requiring him to pay support and that he should have raised the issue when that order was given to him. In the late ’80s, a process server signed a document alleging that the court order was delivered to Alexander at his father’s house and that he refused to sign it. However, WXYZ-TV ABC 7 Detroit made contact with the Michigan Department of Corrections and confirmed that Alexander was incarcerated at the time of the delivery of the court order, meaning it was impossible for him to have seen the order and refused to sign. Alexander maintains that he never saw the order and knew nothing of the alleged paternity dispute until he was pulled over and informed many years later. At one point, Alexander scraped together money for an attorney, despite being underemployed, but legal help did not produce results. However, he has yet to attempt to have an attorney contest the validity of the aforementioned process server’s form alleging that Alexander saw the court order. Based on his alibi placing him in jail at the time that the order was served, it appears that the document claiming that he saw the order might have been fraudulently or erroneously filed. Alexander subsequently tracked down the mother alleging paternity and obtained a DNA test which proved that he is not the father. The mother told WXYZ-TV ABC 7 Detroit, “I had to turn to welfare to get assistance… and I had to put him down as the father. That was the only way I could get assistance… He shouldn’t have to pay it at all. I want everything to go away for him so he can go on with his life.” After she asked the court to waive the paternity claim, a judge assigned to Alexander’s case waived the portion of the child support judgment that would have been given to the child’s mother, but kept alive the order requiring him to pay back the government’s welfare contributions made on his behalf. “I feel like I’m standing in front of a brick wall with nowhere to go,” said Alexander. In the 2007 Florida Supreme Court case Parker v Parker, a Florida man’s $216,000 child support judgment was upheld even after DNA evidence proved that the child in question was not his. At the time, state law required that paternity be contested within one year of a divorce, and, due to the fact that he at that time believed his ex-wife’s claim that the child was his, he did not attempt to challenge paternity. Publicity about the case eventually led Florida politicians to change the law requiring such claims to be filed within one year. PreviousEx-CBS reporter: Government agency bugged my computer. A former CBS News reporter who quit the network over claims it kills stories that put President Obama in a bad light says she was spied on by a “government-related entity” that planted classified documents on her computer.